Not all cemeteries/graveyards have tons of acreage and are run by top notch management companies. I know the grave of my Nana is underwater a number of months each year, no matter how loudly I complain. (I have an idea regarding this issue and if I am arrested I may have to beg for bail from you, dear readers! ha). There are many family cemeteries and private cemeteries on people’s personal land. The upkeep of the headstones can sometimes be less than favorable. I remember when on Memorial Day a picnic was held next to one of the old cemeteries and everyone pitched in to mow, weed and clean up the area. 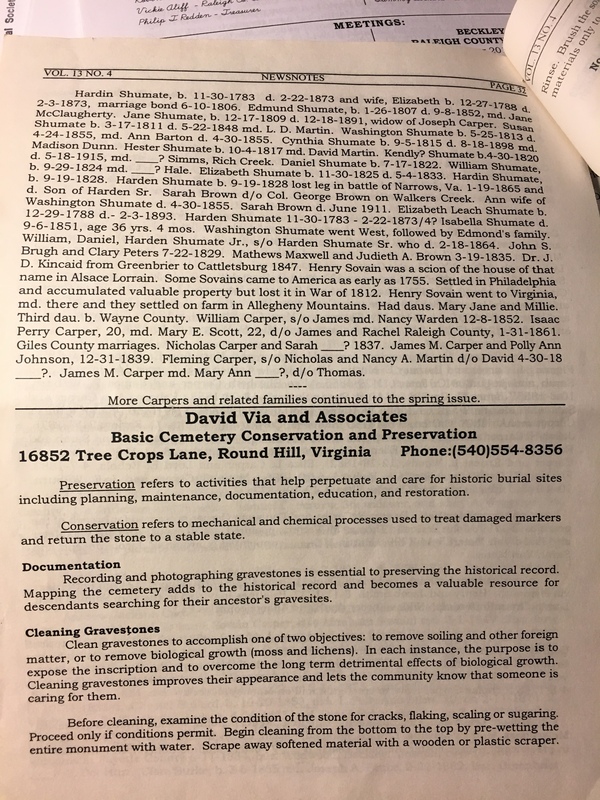 I came across an article in the News Notes, Fayette and Raleigh Counties Genealogical Society, Vol 13, No. 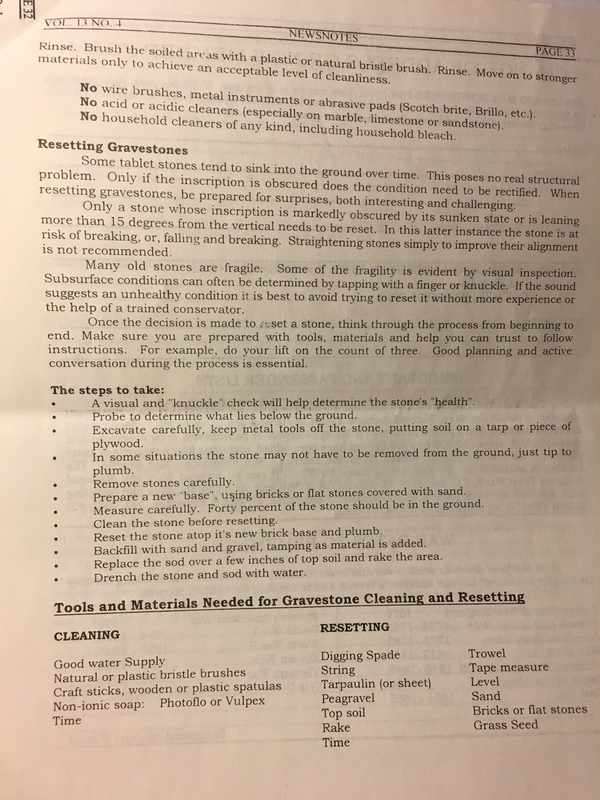 4 Pages 32-33 (Winter 1996) which offers some good tips on the conservation and preservation of cemeteries. I am currently in talks with St Sebastian Cemetery in Raleigh County. This summer I plan on doing a random act of genealogical kindness. I will photograph the couple of hundred graves and upload the photos to Find A Grave. I know that most of the graves have memorials but a quick check of the website shows no actual headstone photos. I have been approved for walking around the cemetery and photographing the stones. I have reached back out to inquire whether they have an index with plot numbers that I could use to prep the memorials prior to adding the photos. I am guessing it will take maybe 3 days to complete (with a little help from my friends). Have you ever volunteered to clean up a graveyard or to record a cemetery? How did it go for you? I would love to hear your input! Please let me know in the comments below!